MAA TV is a Telugu-language television channel based in Hyderabad, India. MAA TV and its subsidiary channels are part of 21st Century Fox's STAR India network. 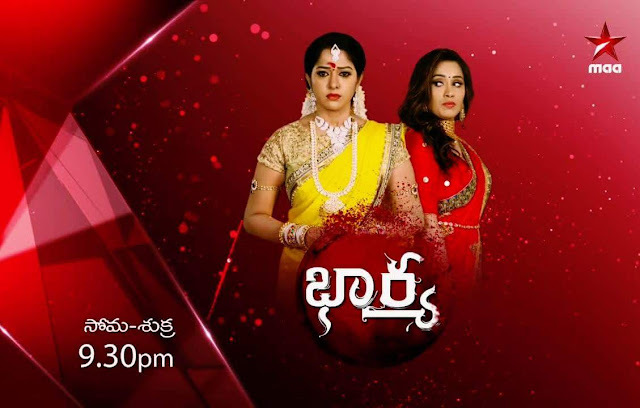 Bharya telugu serial is all set to enthral the television viewers on Maa Tv from March 12.The show will be aired from Monday to Friday at 9:30 pm on Star MAA. The promo shows a newly married woman Anandi being mistreated by her husband's family. After her wedding, she's prevented from entering her husband's house. Left stranded and alone, what will the poor soul do? asks the narrator in the promo. By the looks of it, 'Bharya' seems to be a highly emotional drama and is in line with the typical saas-bahu soaps on offer on television. Meanwhile, with 'Bharya' being allotted a prime time slot, it puts to rest rumours of 'Pavitra Bandham' changing its timing to feature at a more suitable time slot.